Recently, Jess Ho wrote what I’m sure will in time become a classic instructional piece for all first/second-generation Chinese migrant children. While so much of it rang true, I’m not sure about the final point, “You’re picking up the bill”. In my experience, that almost never happens, and only ever on occasions when the kids have somehow through a cunning plan of distraction, stealth and misdirection. My father and uncles seem to have an uncanny knack of ‘needing to go to the bathroom’ at the end of the meal, and of course on their way back to the table, often unbeknownst to all present, they’ve stopped by the cashier’s counter, and settled the bill. As my generation has grown up, gotten jobs, and in some cases, spawned kids of their own, and my parents’ generation one by one have resigned themselves reluctantly to retirement – and subsequently taken up day-trading as a collective hobby – things have changed a little. Somehow, my generation hasn’t taken to the notion of trying to be the one who pays for everyone. It might be that we don’t see each other as much as we used to – my cousins and I aren’t as tight with one another as my parents are with their siblings – so you don’t exactly know when someone’s going to shout you a massive Chinese banquet in return. Not that it’s about keeping score, but there’s a part of our upbringing which ingrained in us the remembrance of our own debt to others, so we kind of live in the expectation that all others have the same morals. Anyway, these days the bills at big family dinners are split, and the largesse is, well, not so large anymore. That’s not to say the feasting is any less extravagant or satisfying. Recently, we trekked out to Doncaster East for my grandmother’s birthday dinner. I arrived a little early, and started to promptly hoe in on some deep-fried signifiers of my youth. 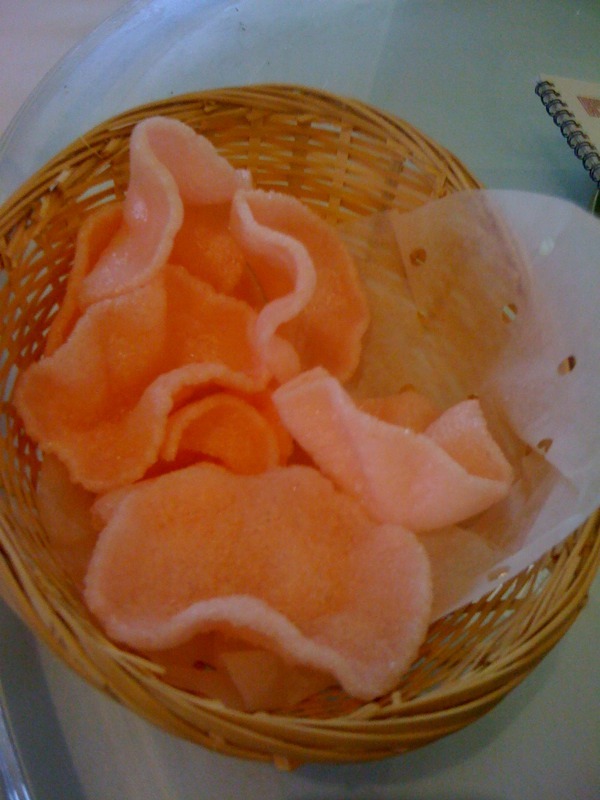 Nothing like an atomic pink prawn cracker to whet the appetite. As the family filtered in, it was great to see the cousins whom I don’t spend enough time with, as well as their parents. It’s a funny thing, because we’re far from being a cold family, but my conversation with aunts and uncles very rarely extends beyond how are you doing, are you still working at [redacted] and the dreaded “so have you got a girlfriend?” which has increased in the past year since my sister got married. Once we had all arrived, the ordering taken care of by a couple of aunts and uncles in secret council – if there are family members of an older generation at dinner, don’t expect to have a say in what you’re going to eat – and soon after, the obligatory first soup course arrived. It was a classic pork and dried bok choy broth, and it was another quintessential flavour from my childhood. The next course was the obligatory seafood starter. Often it’s crab, but this time it was oysters and baby abalone. The oysters were steamed and hada classic black bean and chilli sauce, while the baby abalone – sorry, I didn’t manage to get a photo – were topped with an XO-tossed rice vermicelli. I prefer my oysters raw, but these were pretty good. The abalone was a touch over-cooked. Then we moved on to the parade of dishes which form the main course. That’s the thing about a Chinese banquet. It may only be four courses, but that main course usually involves at least four dishes, eaten with rice, so it’s rare to ever walk away feeling anything but stuffed. This first dish was something of a mystery to me. I was told that it was geoduck, but I can’t really imagine geoduck would have that texture. It seemed more like some sort of membrane than a sliced clam meat. In ant case, it was interesting and new in a good way, and well matched with the rather assertive garlic chives. From the exotic and unfamiliar to the comforting and well-loved. Simple baak jaam gai – literally translated as white chopped chicken – is, for me, probably the perfect way to cook chicken. 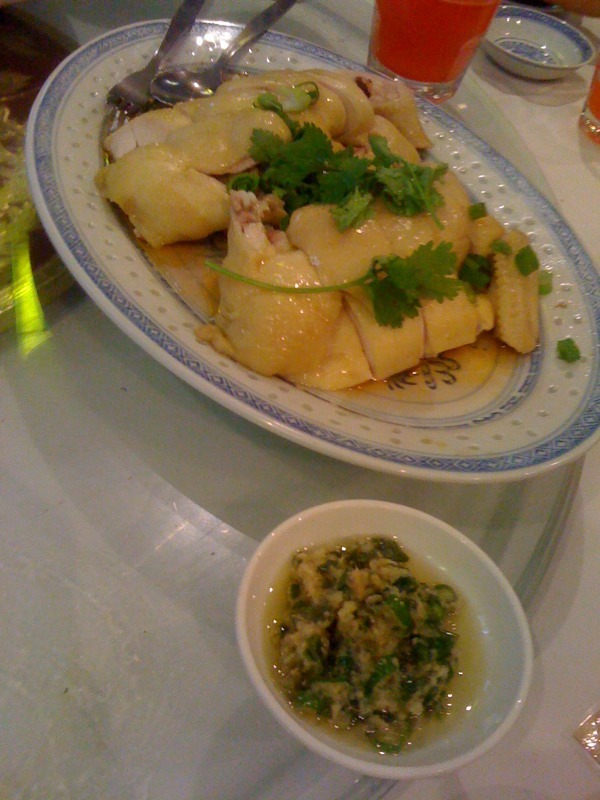 The chicken is basically boiled (or sometimes steamed) just to the point where it’s barely cooked. The sign of a good baak jaam gai is that the blood in the thicker chicken bones is still red. Once it’s gone brown, the chicken has been over-cooked. It’s most commonly served with a ginger and spring onion oil. The chicken at Vessel was superb. Cooked to perfection, with the meat juicy, silky and tender, and the skin gelatinous and plump. Here’s a close up. Despite – or in fact, because of – its simplicity, this was probably my favourite dish of the night. The next dish was much less successful. Choy sum in some kind of bland broth, garnished with what seemed to be dried scallop strands, but much too long to be dried scallop strands. Bizarre. In any case, the whole thing might have been good, were it not marred by a slick layer of oil which seemed to coat the whole dish. Then there was an unexpected detour from dishes that I’ve encountered in the Chinese banquet arena. With the exception of a whole steamed fish, most dishes tend to be presented in a way that makes them easily shared; that doesn’t involve having to serve each other, though we always end up doing that anyway. 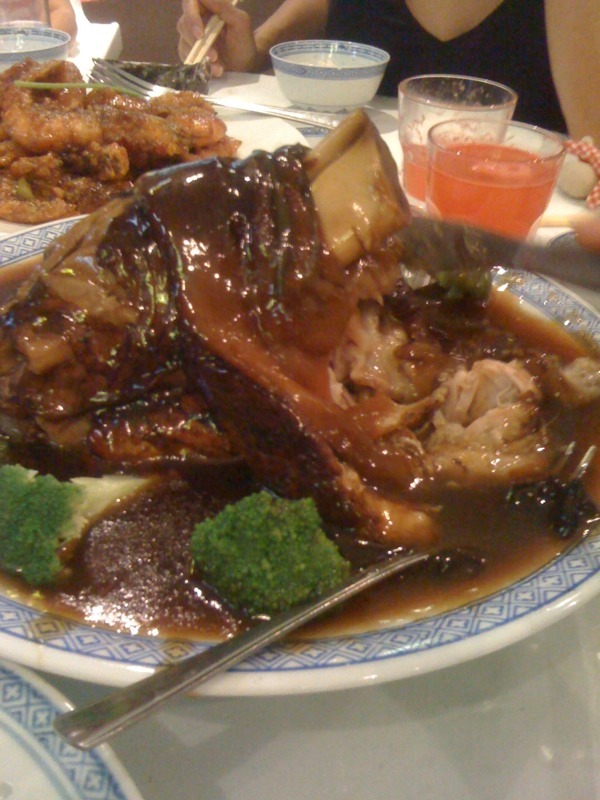 Not so with the braised pork hock. It’s a magnificent, impressive dish, I’ll grant you, but it’s a little messy to negotiate on a lazy susan, and the meat wasn’t as tender as you’d expect. It really needed those swathes of sauce on the plate. Then there was a venison in honey and black pepper. The meat seemed to have been treated with bi-carb, and lost a lot of its meaty texture. Not as extreme as some dishes I’ve had in other restaurants, but noticeable. Is venison that tough that you need to use soda with it? Anyway, the flavours were quite good, and I like the mixture of wood ear fungus and snow peas. Fried tofu with a crab meat sauce. The tofu could have been a bit smoother. Tofu is usually one of the dishes that my nanna adores, because it’s soft and she can manage it with her falsies. 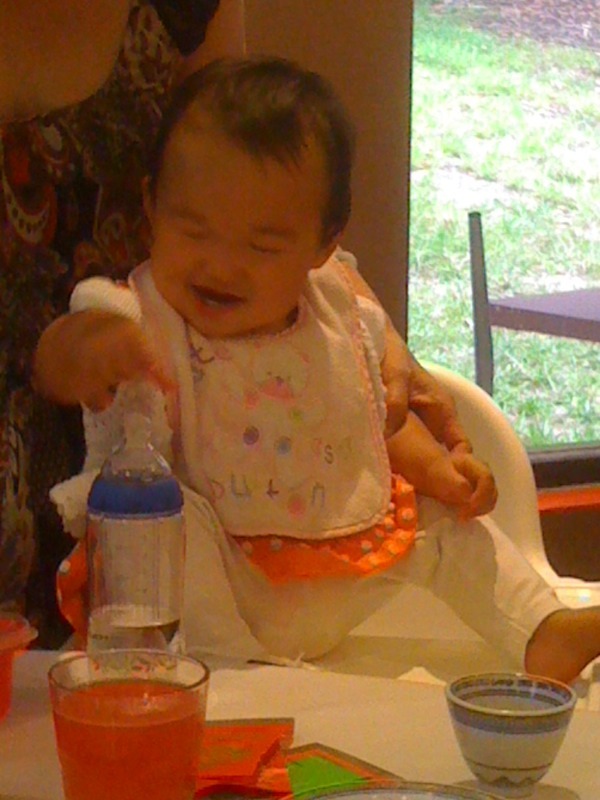 she didn’t really like this dish that much. Neither did I, but that was more about the cornstarch gravy being a bit too gluggy. One of my favourite dishes in the world is geh jup haar look. In case you can’t figure out the first two syllables, I’ll give you a clue. It’s also spelled catsup. 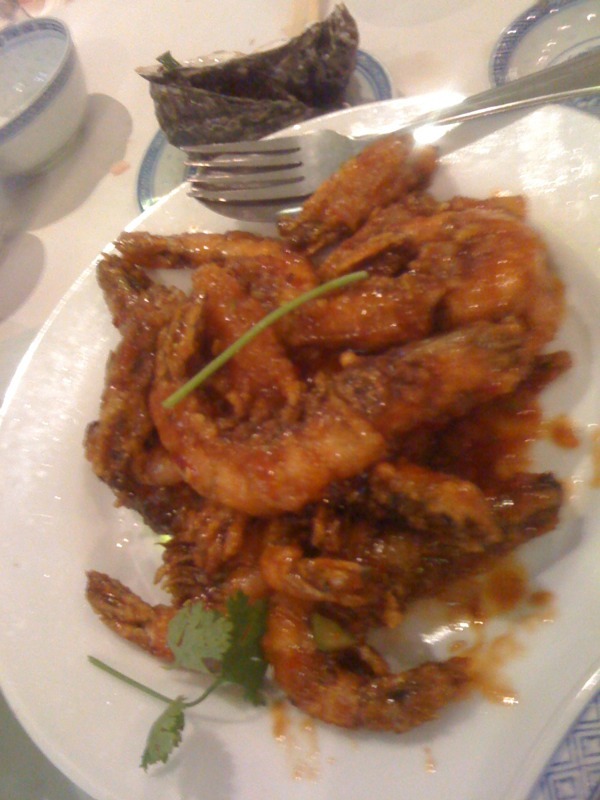 These whole prawns are deep fried, then coated in a ketchup based sauce. Sounds odd and altogether un-Chinese, but I assure you they’re amazing when done well. And Vessel does them very well, thank you. At this point, as you can see, the table is full. And very quickly our bellies are reaching a state to match. But of course, there has to be a fish dish. Plates were shuffled to accommodate the fish, which quite sadly, we didn’t manage to finish! It was a cod of some description, and it was steamed beautifully, the flesh just reaching the point where it flakes away cleanly. After all of this, there was the customary dessert. It being summer, I thought they might have served something else, but no, it was the standard sweet red bean soup. Served warm, too. I don’t mind it served cold, but warm, it’s not so much cleansing as cloying I find. Clearly, my cousin’s little daughter doesn’t agree. Haha love the bit about uncles and aunts in secret council, ordering the dishes. 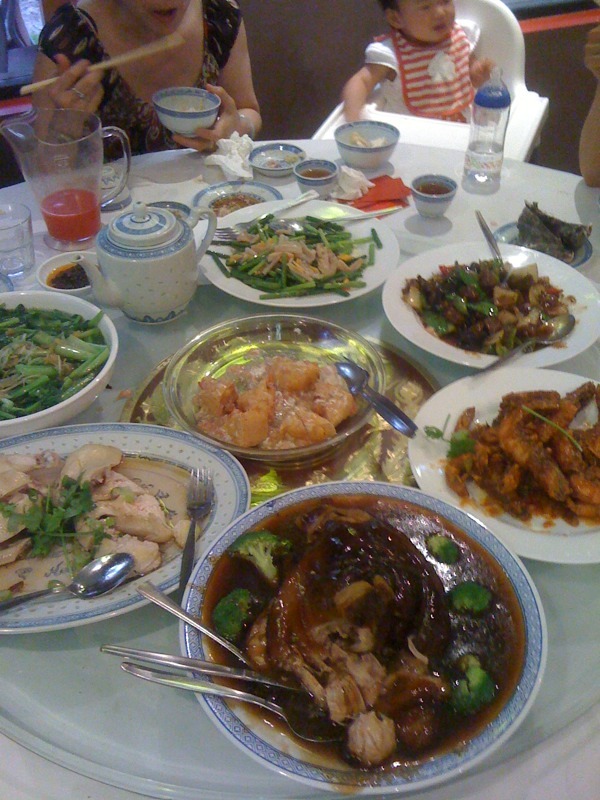 I look forward to the fish dish the most during a CHinese meal, it’s such a pity you all were too fulfilled to finish it! Totally diggin the new look yo! Love how you started with Oysters…oh how I’m cravin me some of freshly shucked oysters. I only wish the oysters were fresh rather than steamed!